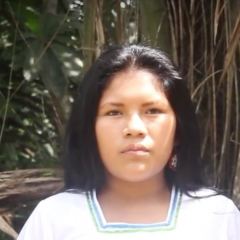 Fernanda Gualinga is a member of the Kichwa Peoples of Sarayaku located in Amazonian Region of Ecuador, and which has held long fights at a national and international level to stop extraction projects in their territory. 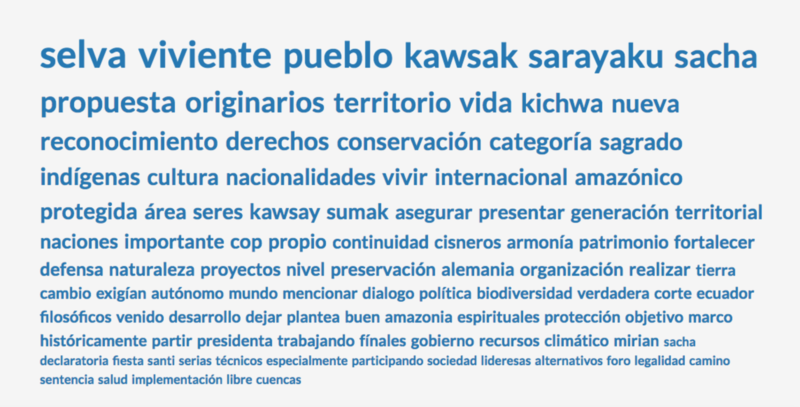 The following is a transcript of the video of Fernanda's analysis of the word cloud for the term “Selva Viviente,” (Living Forest) which is a way of life to live together with nature. Within the word cloud, the word “derechos” (rights) attracted Fernanda's attention. I chose the word ‘Rights’. Why? Because our rights, especially those of women have been violated by the big transnational corporations. I am referring to oil companies, mining companies, and lumber companies. What I want to appear in these word clouds are ‘youth,’ ‘woman,’ and ‘indigenous’. We also want our rights to be respected. Mónica Bonilla assisted with the transcription and translation, which was edited for clarity and length.